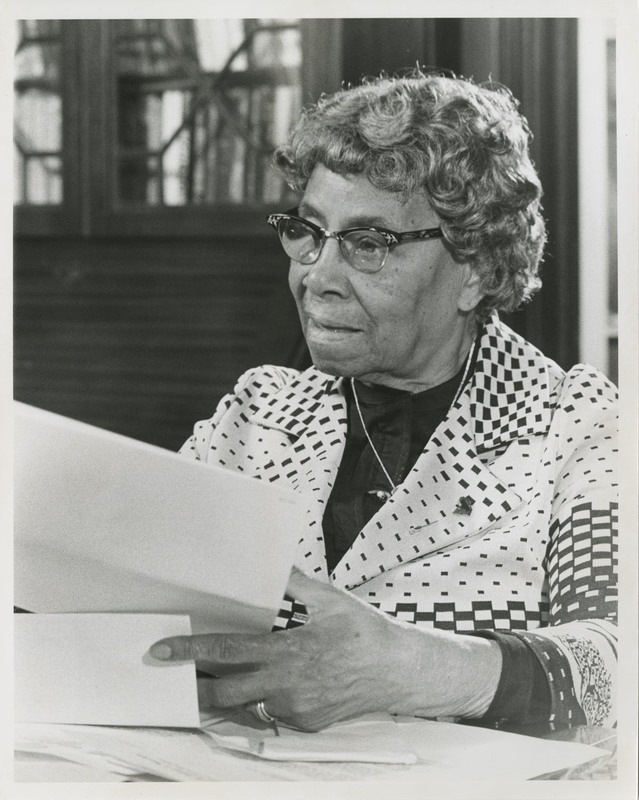 Septima P. Clark sitting at a desk with papers during filming for television documentary about her life and work, Septima P. Clark Papers, courtesy of the Avery Research Center. 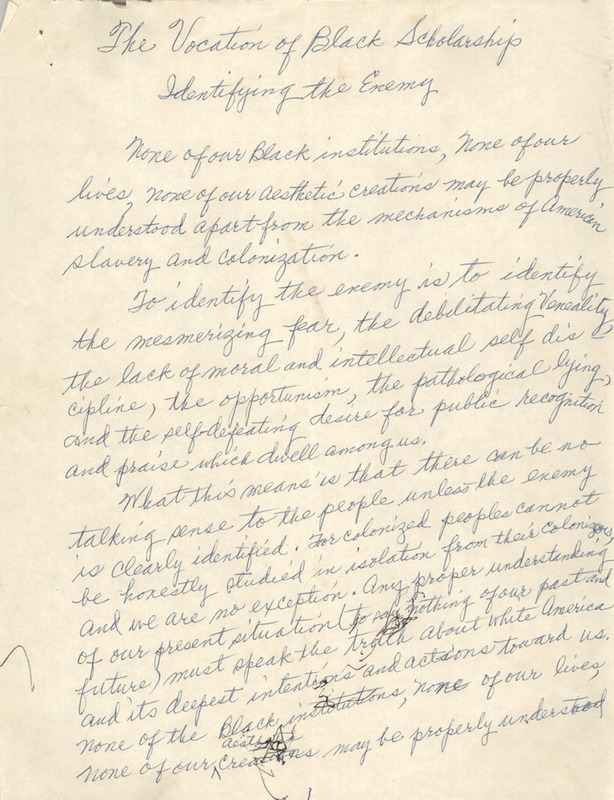 "The Nature of the Current Revolts," handwritten essay by Septima P. Clark, n.d., Septima P. Clark Papers, courtesy of the Avery Research Center. CLICK HERE to view larger image and full essay. 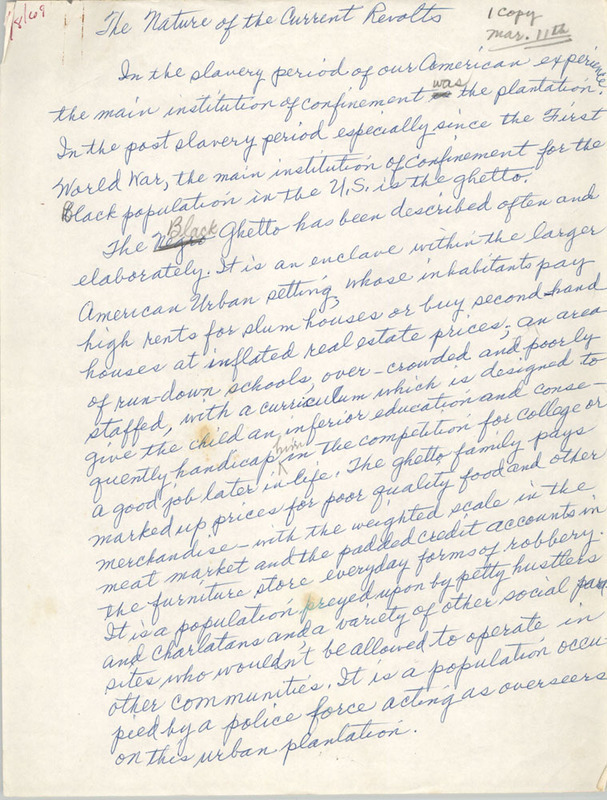 "The Vocation of Black Scholarship Identifying the Enemy," handwritten essay by Septima P. Clark, n.d., Septima P. Clark Papers, courtesy of the Avery Research Center. CLICK HERE to view larger image and full essay. Over the four decades since Clark wrote this essay, the nation’s law enforcement has become even more militarized. Some of those who knew and worked with Clark, such as lifelong Charleston activist Bill Saunders, share her ability to identify root problems as necessary to explain the full context of police violence in the Charleston area. For Saunders, this includes a tragic shooting in April 2015, when an unarmed black man, Walter Scott, was shot in the back and killed while fleeing from a white North Charleston police officer. While committed researchers and activists might discover this Septima P. Clark on their own, what about the public more broadly? Where do we draw the line between obscuring complex historic representations to reach the broadest audience possible and conveying the most accurate historical representations, even when they do not fit into comfortable narratives? There are no easy answers. Yet as long as Charleston’s public history landscape excludes these understandings of Clark’s life and work, and the diverse networks and spaces she engaged, we inhibit the city’s radically democratic potential and the activism of its citizens. As Septima P. Clark powerfully asserted, “I believe unconditionally in the ability of people to respond when they are told the truth."